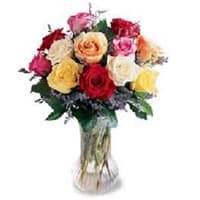 Render happy moments to your loved ones with this Fashionable Soft Touch Dozen of Mixed Roses in a Vase and frame it forever in your memory and heart. Conquer the heart of dear ones with this Gift. 12 Mixed Roses in a Good Quality Vase. and Cadburys Celebration pack. 12 Mixed Roses in a Good Quality Vase. with 500 grms Assorted Sweets. 12 Mixed Roses in a Good Quality Vase. with 16 pcs Ferrero Rocher Chocolate Box.